You are here: Home / Health / Is garlic good or bad for dogs? Garlic has long been utilised as a safe medicinal plant in medicines for humans and pets. However, there has been a lot of controversy related to the safety of garlic for dogs. Many pet parents wonder if garlic is safe for their pets, and if so, how much quantity is appropriate. They also want to know the health benefits of garlic, and whether all breeds can be given garlic. Garlic is seen under suspicion due to its properties as a member of the Alliumgenus, a branch of the lily family, along with onions and shallots. A compound found in garlic called n-propyl disulfide, in large doses, cause oxidative damage to red blood cells, creating Heinz bodies and triggering the body to reject these cells from the bloodstream. If large doses of this compound are ingested on a regular basis, the process can lead to Heinz-body anemia and even death. Use fresh, raw, organic garlic whenever you’re supplementing or feeding garlic to your pet. Nothing from a jar. Garlic has been used for thousands of years in Chinese and Ayurvedic medicines. It contains at least 30 compounds that have been found to be useful for a variety of conditions from skin disorders to cancer. 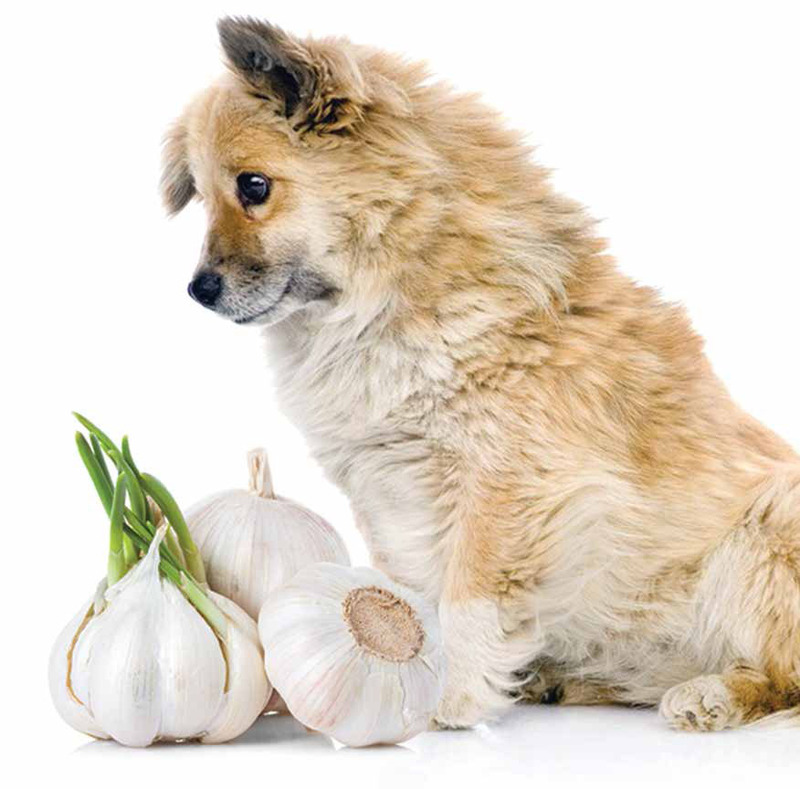 In fact, veterinarians have been recommending garlic for many years for its multiple health benefits. Boosts immune system: Garlic stimulates immune functions in the bloodstream by increasing the activities of killer cells (cells that seek out and destroy invading germs and cancer cells). It is therefore beneficial for dogs with suppressed immune system and those fighting cancer. Moderate garlic supplementation in the diets of your pet can boost their immunity and prevent cancer. Fights bacterial/viral/fungal infections: Garlic is a powerful antimicrobial and antibiotic. It is effective in fighting various forms of internal or external bacterial, viral, or fungal infection, including parasites (e.g. tapeworms) and protozoan organisms (e.g. giardia). Inclusion of fresh garlic in your pet’s diet can fight infections of the mouth, throat, respiratory tract, stomach, or intestines. Crushed garlic diluted in olive oil can be applied as a topical antiseptic for minor injuries, ear infections, or ear mites. Enhances liver functions: Garlic has detoxifying effects. At least six compounds in garlic can enhance liver functions by helping the liver to eliminate toxins from the body, thereby preventing toxic accumulation that may lead to cancerous growths. Lowers blood cholesterol and triglyceride levels: Uncooked garlic mixed with food helps lower blood cholesterol and triglyceride levels in dogs, making it useful for certain breeds (e.g. Miniature Schnauzers, Beagles) who are predisposed to hyperlipidemia, a condition in which the amount of fats (lipids) in the blood is elevated. Acts as a cardiovascular tonic: A compound in garlic is effective in preventing blood clot formation in the cardiovascular system. It can also reduce cholesterol levels and fat build-up in the arteries. Therefore, it is an excellent cardiovascular tonic for older dogs. Natural tick/flea repellent: The exact reason and extent of garlic’s effect in tick and flea prevention is not clear. It may be due to the odour released through the skin when compounds in garlic are metabolised. Whatever the reason, there are a lot of anecdotal reports on the effectiveness of garlic (especially in combination with brewer’s yeast) as a tick/flea repellent. Garlic for dogs – How much and how often? Dr Messonnier (author of the book The Natural Vet’s Guide to Preventing and Treating Cancer in Dogs) recommends one clove of fresh garlic per 10 to 30 pounds of weight a day to boost the immune system and prevention of cancer. As with most herbs, at least 1 -2 days off per week or a periodic week off from garlic is a good idea. Garlic is safe for your pet when you feed it in limited quantities. However, there are some cautions. Always be cautious with any medicine or supplement to give during your pet’s pregnancy. Consult your veterinarian when feeding garlic to expectant female dogs. Garlic also changes the taste of breast milk, so avoid feeding it to lactating mother dogs. Don’t give garlic to puppies under six months. Puppies of eight weeks or less don’t produce new red blood cells so never give them garlic. For puppies aged six months to a year, you can be cautious and feed half the regular dose. Certain breeds are at a higher risk of negative effects of garlic. Veterinary herbalist Susan Wynn warns against giving garlic to Akitas and Shiba Inus. These breeds are more sensitive to the hemolytic effects of oxidants such as N-propyl disulphide found in garlic. Talk to your vet to know more about this. If your pet is on any of these medications, avoid adding garlic to his diet. Garlic is known to affect blood clotting, thus, eliminate it from your pet’s diet two weeks before any scheduled surgery. It is always recommended that you talk to your vet before including any new dietary changes for your pet. There might be chances your pet is allergic to garlic or garlic is unsafe for him due to a medical condition. Your vet knows the best, so listen to his advice.